Updated for Mists of Pandaria, patch 5.4.8, wih some Warlords of Draenor notes. This page is specific to Beast Mastery Hunter PvP and covers your build, glyphs, gems, enchants, pet info, and more. 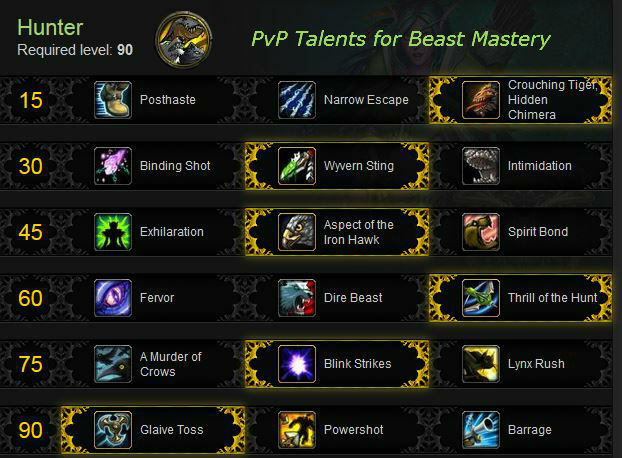 If you’re looking for PvE (raiding and such) then see our other Beast Mastery PVE Hunter page. 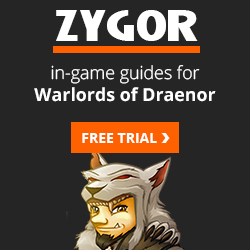 Some aspects of this guide may not apply to your Hunter until higher level. If are interested in getting your character to max level quickly, take a look at this leveling guide and get to 90 ASAP. We have a post up detailing the Hunter Changes in Warlords of Draenor. Some other notes are added in the guide below. Bestial Wrath – acts as a second PvP Trinket, plus additional damage. It also greatly cuts your focus costs while active. The Beast Within – More damage and lower focus costs while Beastial Wrath is active. Stampede does more damage than MM or S since it gets your Mastery bonus. Exotic Beasts lets you use better pets. Your pet is good enough to take some pressure off of you. Damage is at least as good as good as other Hunter specs, though MM does a bit more to plate due to Chimera shot’s magic damage. Also see our Hunter PvP Gear Guide. Since PvP can be anything from World ganking to arena to battle grounds to dueling and more there is no “one perfect build.” Fortunately the talents are easily swapped. Keep a stack of Tome of the Clear Mind handy and swap talents as needed. In Arena the changes are free. Glyphs, too. A couple of the 1-90 talents will be changing in Warlords of Draenor, in addition to the level 100 talents. Those notes are added to the descriptions below. Take all of those notes with a grain of salt, as they will change before release. Also not that with the great item squish that’s coming all damage numbers will be very different from Mists numbers. The first two improve Disengage, while the third gives you more of them and more deterrences. Posthaste is a maneuverability boost: leap back and have a few seconds of increased speed. Breaks free of snares, roots, etc., but does not provide resistance to those effects. Yes, you can be snagged again right after disengaging. The movement burst stacks with similar effects. Disengage and chase people down, or escape. Crouching Tiger, Hidden Chimera allows us to use two of our survivability tools more often, which is pretty cool. The reduced CDs more than make up for the lowered mobility by not taking the other two talents. If you don’t need the reduced CDs then Narrow Escape is a better choice. Binding Shot sticks the enemies to the arrow and can stun them. Nice for peels and groups. Wyvern Sting – land this one right and it’ll keep a player out of business for a few, important, seconds. Helps to land traps. Paladins and Druids can dispel this. If you’re focusing on CC then this is the pick. Nice for duels and 2s. Intimidation – your pet briefly stuns the target. 1 min CD. Nice if you really need an extra stun or your pet is on someone who is out of site and you can stun him. Exhilaration is a nice self heal and a strong pet heal. The burst heal is more useful for one on one and smaller fights than the others, since damage tends to be bursty. Aspect of the Iron Hawk makes our best aspect even better with respectable damage mitigation. Especially good in larger fights, where you might have damage coming in from various sources. Does not require your pet to be alive. WoD: This talent is changed to Iron Hawk and only applies the damage reduction. The AP boost is gone. Spirit Bond Nice when not fighting melee, esp. in 2s. Many prefer this talent to Iron Hawk. Note that your pet does have to be alive for you to benefit from the bond. Short answer: Thrill of the Hunt for more overall pressure, Fervor for on demand burst. Fervor returns focus both instantly and over time, which has its uses when setting up for a burst. Thrill of the Hunt will provide a lot more shots over the duration of a fight, but the procs, while common, are random. Dire Beast is somewhat weaker than the other two. Thrill of the Hunt has a chance to give you focus free Arcane Shots or reduced cost Multi-Shots. It will allow you to spam more Arcane Shots than the others so is the pick for this tier. With the reduced focus cost that Bestial Wrath provides you should be able to so some serious Arcane Shot spamming. Since it’s a random proc it might not be there right when you want it, though it will do more damage of the course of a fight. A Murder of Crows is a good choice for PvE, but PvP needs the burst and this doesn’t do it. Still, it’s a fair amount of added damage to a target. Depending on your game this may be the best choice. Blink Strike puts your pet where it belongs, right now, especially if it isn’t where it should be. Or even if it is (since it gets that 50% damage buff.). Also, your pet won’t have to (slowly) wander around obstacles and long paths to get to the target. Much shorter cooldown than Lynx Rush.If you’re kiting someone and another pops up in your face (eg: some Rogue) then your pet will blink right to the new attacker. Lynx Rush has a very long cooldown for somewhat more damage, making Blink Strike generally much more practical. However, Lynx Rush is superior for duels and other 1 on 1 fights due to the damage. With several targets close to each other, it’s not so hot since that damage will be spread out too much. Also, the A of E bleed will break traps. WoD: Lynx Rush is dead and is replaced by Stampede. Yes, that’s the ability Stampede. Glaive Toss has decent damage, is instant, low cost, and has a short cooldown. The movement speed reduction (snare) is a nice bonus, especially when kiting melee. Powershot does nice damage, BUT has a long cast time (making it interruptable) and a long cooldown. It also seems to need a crit to do solid damage and crit chance isn’t all that hot in Mists. Maybe in Season 15 onward, if cit chance improves significantly. Barrage should be avoided for the time being. Channeled and doesn’t hit that hard. These are all subject to change or even removed in favor of new talents before WoD launches. Exotic Munitions. You can change ammo types, each change lasts an hour. In WoD your Serpent Sting is gone, this is the talent to use for a similar effect. Adaptation: Your pet gets increased damage and also gets several abilities, regardless of its active spec: Spiked Collar, Roar of Sacrifice, Cornered, Last Stand, Blood of the Rhino, Great Stamina, Cornered, Boar’s Speed. All of the interesting utility is with the major glyphs, minors are mostly cosmetic. A number of glyphs are useful for various situations. You should keep a stack of Tome of the Clear Mind and swap as necessary. In Warlords of Draenor some major glyphs will be learned automatically, just like talents and abilities. There will probably be six of them and those six might be: Glyph of Liberation, Glyph of Pathfinding, Glyph of Mending, Glyph of Chimera Shot, Glyph of Black Ice, and Glyph of Misdirection. All other glyphs will be purchased as they have been in the past. Major Glyphs – More or less in order of preference. Arena might pick: Solace, Animal Bond, and Deterrence. Mirrored Blades Vs casters. Glyph of Deterrence – Adds more damage reduction. Glyph of Animal Bond – All healing to you and your pet is increased. Nice if you have a good healer. Glyph of Mirrored Blades – Definite use when spells are coming your way, if you have decent timing. Glyph of Explosive Trap – Because knockback is much more useful (and entertaining) than a bit of damage. Since it doesn’t do damage it doesn’t break other traps or CC. Glyph of Solace – Your Freezing Trap and Scatter Shot remove all DoTs from the target, which insures that those effects stick. Glyph of Disengage – Increases your disengage distance, which is pretty nice in all situations. Also allows you to jump from low to higher ground, which melee will find a bit inconvenient. Glyph of Mending – Pets are weak and are constantly attacked. This helps to improve their chances. Glyph of Master’s Call – Extends the duration of a very useful ability. Glyph of Revive Pet – Makes reviving your pet easier when under pressure. Glyph of Aspect of the Pack – Helps the group move faster. Glyph of Aspect of the Beast – Become untrackable. Glyph of Marking – Puts a bulleye, instead of the standard mark, on the target. Clearly an essential glyph. Pretty much the same for any Hunter. Agility and then more Agility. PvP Power and Resilience went through some big changes in 5.3 onward and gemming those stats is no longer recommended. WoD: Hit, Expertise, and Resilience are all dead in Warlords of Draenor. Hit/Expertise: These are your #1 stats, unlike PvE. In PvP missing that key hit or CC can be, ahem, critical. Missing is bad, don’t do it. Your pet inherits 50% of both, but only needs Hit and uses half of your Expertise to add to its Hit rating. So if you cap both your stats then you pet will also be capped. Some people will want some extra Expertise given the high dodge chance of classes such as Rogue, so will get a few extra points. Going over 6% isn’t worth the effort. Mastery is a straight up damage increase for your pets and those pets will be a solid portion of your damage. Crit is important for burst, especially when the numbers go your way. Haste is more important for PvE with the Agility procs from various items. High haste gives a lot more uptime for those procs. You don’t have those in PvP, favoring “on use” items. While Haste does speed up everything you do the Mastery and Crit simply result in more damage when you want it. Resilience: Hunters are actually fairly squishy. Depending on your skills at avoiding Warriors, DKs, etc. you may want to put a priority on Res. over other possible stats. Especially since burst damage in M of P can be pretty impressive. In patch 5.4.2 Resilience is 72%, in 5.4.7 it’s 77%. Then there is the two trinket set bonus with even more res. That should be more than enough. PvP Power, which is a direct damage add Vs players only was reduced in value by a third in 5.3 and then the value of the gems was cut in half. It isn’t bad, but any means, but Agility and the other stats are now better. reforge everything else into Mastery and then Crit. WoD: Reforging is dead in Warlords. If you can afford to do so then buy the best gems available. If cash is short then see our gold tips or you can check out the very handy Tycoon addon. Gems with secondary stats have twice the value of gems with primary stats, for example: 160 Agility Vs 320 Crit. This means that you should be matching gem sockets for the bonuses. Note that “perfect” gems have the same stats as the regular gems, but the costs might be very different. Buy the cheaper ones. All of your gems should be Agility and/or Crit. Skip the other stats completely. You do not need to gem for PvP Power or Resilience, esp since the latter will be well over 80% with season 15 gear. PvP Power, after the 5.3 nerfs isn’t worth gemming. Esp. with season 15 gear you should have no need for added Hit or Expertise, in fact you will probably be reforging those away. Gemming them will not be necessary. You should only match sockets that offer an Agility bonus. Your call on sockets with PvP power bonus, though just putting Agility gems in those sockets is probably better. Not by a lot, so it’s your call. Meta socket: Agile Primal Diamond until you can get Tyrannical Primal Diamond. If you raid enough to get the legendary gem then you should, it’s a definite DPS add over the other two gems. Meta Capacitive Primal Diamond: +324 Critical Strike, and chance on melee or ranged hit to gain Capacitance. This is a solid DPS add over the other two gems. The chest item is the only standard Resilience enchant, there are no standard PvP Power enchants. There is a weapon enchant that costs Conquest points and which adds both, plus disarm resistance. Basically you’re enchanting for Agility, Crit if Ag isn’t available. There are no head enchants, all shoulder enchants are from the inscription profession. If you need more cash to be able to buy these things then check our Tycoon review. The Agility ranged wpn enchant is better than the Tyranny enchant, but the latter isn’t random, either, and it provides disarm reduction if you’re interested in such things. Also the Tyranny enchant requires you to have earned 25k Conquest points in the current season to access the vendor and have earned 27k to be allowed to buy it. Then you only need 1k available to actually buy it. So once you hit 26k CPs make sure you save all the rest and buy it when you hit 27k. Enchant Weapon – Glorious Tyranny: 600 PvP Power, 50% Disarm duration. Living Steel Weapon Chain– Reduces duration of disarm effects, +200 Expertise. Cloak Swordguard Embroidery: Chance for 4k Attack Power for 15 sec. Req. Tailoring. Chest Enchant Chest – Glorious Stats: +80 to all stats. With the new resilience rules this enchant is the better choice. Blacksmithing might be the #1 or #2 most valuable profession if you’re just looking for the buffs. Engineering can also claim to be #1 with the Synapse Springs enchant, plus it has lots of useful/fun gadgets, but leveling both professions will probably bankrupt you. Alchemy and Herbalism are a nice combo. You get added benefit form your potions and other chemicals, the Haste and Spirits from your flower picking skill are quite nice. In WoD all of the profession bonuses are dead. Profession will be for game flavor or earning gold. Jewelcrafting Make nicer gems for your own use, install two of them. Enchanting Enchant both rings, for a total 320 Ag gain. Alchemy More effect from your own potions (about 30%.) Adds 320 Ag and an extra hour to your main flask. Herbalism Small heal and 2880 Haste for 20 seconds. Can also find life spirits. Nice to have in any area where they are allowed. Note that Pandarens get twice the food buff. All food buffs last one hour. Any Agility bonuses also add to the food and chemical bonuses. Alchemists will get about 30% more in stats and an extra hour in duration from flasks and elixirs. Food buffs go away when you are killed, flasks do not. Your agility flask is better than any pair of elixirs. Runescroll of Fortitude III: 8% increased Stamina to your entire group. Stacks with your flask, unlike Agility scrolls. In Warlords the pet abilities are changing. The big change is that their crowd control abilities are being removed. Details are here. Cooldowns for pet abilities are very slightly shorter than they are for MM or Survival. Patch 5.3 doubled the CD for abilities such as Lullaby. Note that in patch 5.2 pet swapping takes a bit longer than before. In 5.3 and beyond the cooldowns are the big thing. You can also keep more pets in your stable. Now you can have one from every pet family with some room left over. Beast Mastery’s ability to tame exotics gives access to The Shale Spider, Quillen, and Spirit Beast. MM and Survival will make do with the others. BM picks: Two shale spiders, one of each spec; and two foxes/goats, also one of each spec. Devilsaur provides a small healing debuff. Shale Spider – 3 second web to 30 yds, increases group Int, Ag, and Str by 5%. Quillen – Can rez and provide the group with a 5% crit buff. Spirit Beast – Mastery for the group, can add some heals, can stealth. Devilsaur – Adds Crit to the group, it’s bite reduces any healing received by the target by 10% for a few seconds. Nice if your team does not otherwise have a healing debuff. Monkey – Gives a 4 second stun, but this has a cast time. Stun can’t be broken by Will of the Forsaken or Tremor Totem. . It’s noises are also annoying to some. Crane – 4 second sleep, instant cast. This shares DR with stuns. It can be broken by Will of the Forsaken or Tremor totem. Foxes and Goats both create a cloud which slows casting. Esp nice against casters teams when your team has available stuns (eg: A rogue,) esp. since the cloud has a fast cooldown. Spider – 5 second web root (30 yd range) that does not break on damage. Plus, a few people are disturbed by spiders and will be a bit freaked out by yours. Or try to instantly mash it. Keep your pet on passive and put attack on a macro. This means that when you switch targets your pet will also switch. In Mists of Pandaria Pandarens can become Hunters. but Gnomes are still left out. 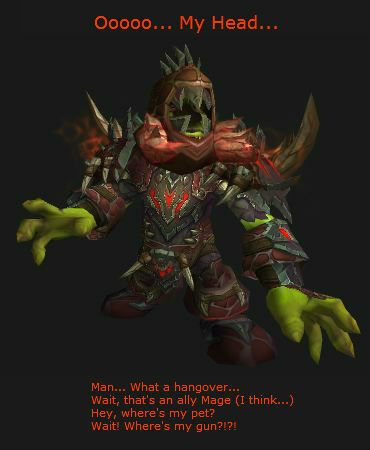 Perhaps in WoW 6? In Warlords the Gnomes are still left out of the club. In addition all racials with Hit or Expertise are dead and most of them are repalced with other racials. The best? If you’re looking towards the end game… Orcs and Trolls are arguably the best Hunter races overall. Humans (two DPS trinkets) and Worgen (sprint and crit bonus) are tops for the Alliance, but all the notes are below. In WoD these two should still be “best” or close to it, but Humans and Draenei will have more interesting racials. can be either Alliance or Horde, they choose a side when they leave their starting area. Pandarens can put enemies to sleep with a touch of the paw, but you don’t want to be in melee range so this ability isn’t that useful to you. Increased benefits from food buffs will be quite nice while raiding, but will be less than the value of one gem. Rested experience lasts longer for faster leveling. Draenei – Small DPS Gain and a heal. +1% hit, a useful self-only ability for all hunters, your pet inherits 50% of this. WoD: The Hit bonus is dead, an Agility bonus replaces it. The heal happens in 5 seconds instead of 15. Night Elves – No DPS gain, nothing much interesting at all. Shadowmeld drops aggro in PvE encounters, but it’s redundant with your Feign Death ability. It does not add to your Camouflage ability. It can break incoming spells if you time it just so. Night Elf hunters also gain the benefit of a 2% dodge chance increase, another bonus to stack with Aspect of the Monkey when forced into melee. This is slightly useful in PvP. Move faster when dead has little value unless you need to quickly get back to where you were ganked. WoD: 2% faster movement along with the dodge. Touch of Elune give 1% Crit by day and 1% Haste by night. Dwarves – Small DPS gain and can wash bleeds. The stone form ability is rather nice, washing away bleeds and reducing damage taken by 10%. You will find plenty of use for this. Dwarves get expertise with ranged weapons, which is nice perk. You have no use for their mace specialization. WoD: ranged expertise is dead and Stone form is improved. Human – Can use two DPS trinkets, which is a decent DPS bonus. Their escape ability is quite nice and allows replacing the escape trinket with a DPS trinket. Increased spirit is worthless to you. WoD: Expertise is dead. The Human Spirit now raises two of your secondary stats. Worgen – Extra Crit is nice, making them the second best best Alliance DPS. Sprint ability doesn’t hurt, either. Their increased skinning skill and speed is a nice convenience, and skinning adds some crit bonus, but it’s otherwise of no special value to Hunters. Blood Elves – No DPS or useful Hunter abilities. Their big ability is Arcane Torrent, which can be used as an AoE silence when forced into melee range with caster classes. Paladins and Death Knights, for example. Ideally Hunters want to avoid “melee range” like the plague. While it will restore a small amount of focus you will need to be in a really long fight to get even one more shot because of it. WoD: The Belves will now have a 1% Crit bonus. WoD: no real changes relevant to Hunters. Trolls are in the top two of all the races for Hunters. Trolls possess the Berserking racial, a potent DPS increase for sustained DPS. Add it to a macro. Trolls get Ranged weapon expertise which is nice. Trolls get +5% damage bonus Vs. beasts, but since Gnomes and Worgen don’t count as beasts this ability is useless for PvP. The Health regeneration is effectively useless. Orcs are the #1 Hunter choice from a DPS perspective. They get the benefit of Blood Fury, a great burst DPS increaser. Add it to a macro. and a 15% resistance to all stuns with Hardiness, a very useful ability given the many stuns in PvP. Expertise with melee weapons is useless for you. WoD: Blood Fury and Hardniess are both nerfed from 15 to 10%. Undead – their new (with Mists) racial gives them some added DPS. They have no special Hunter abilities, but their “Will of the Forsaken” can wipe off sleeps, charms, etc., a very nice ability to have. Being able to eat the brains of those you kill frees up a blag slot (which would otherwise carry food) and helps to rub in your superiority. Undead can drain life from opponents and be healed for the same amount. This is a passive effect and happens occasionally with your damaging attacks, it will add a bit to your overall DPS and self-healing numbers. WoD: Underwater Breathing returns as an ability and is improved. Rocket Barrage is fun, but nothing more than that. The beauty of playing a Hunter is that almost every Hunter is different – even among similar specs you will find different players do different things in different situations. But to start you off, you need only know of two different styles. 1) The offensive Hunter: A great start for most people, making your enemy go defensive is the best way to prevent your enemy from creating any real pressure. However this can cause many problems, and you will quickly see how easy it is for enemies to Line of Sight you – while this keeps them from being offensive, it also prevents you from creating opportunities so fluidly. 2) The defensive Hunter: Most players experienced in other classes will start off defensive rather than offensive – because they know what other classes are capable of. With the addition of Aspect of the Fox, Hunters are now able to pull off their entire rotation on the move, which allows you to go begin a cast, then move out of Line of Sight of a target, and then move back in when the cast is about to end, fire and instant shot with that cast, move back out of los until your Global Cooldown Ends, and so on and so forth. This is a great style for Hunters, and it makes things a whole lot easier for your healer. However you also miss out on opportunities that you otherwise could have created had you been more offensive. Naturally the best thing to do is combine the two, play defensive and pull your opponents into you, so that their healer will follow into the open – giving you an opening to go offensive with some Crowd Control on the healer. Remember one thing though: You should adapt with the season, if games are long, go with some Marksman for some decent control – if Burst is high, go BM and help your caster out with bloodlust, or even Survival with Wind Serpent pet to give him that extra 5% magic damage. Note that Hunter’s Mark is automatically applied with your Arcane, Chimera and explosive shots as well as with your Kill Command. The Mark can be applied when you are well out of range of those attacks, which has occasional use. If you’re in range then your shots will apply it. Apply Murder of Crows (if you took it) and you’re bursting. Counter Shot as necessary or your pet’s Intimidation, if you took that talent. Cobra Shot is usable while moving and extends Serpent Sting. Generates focus. Arcane Shot when Thrill of the Hunt procs. Your Master’s Call to Break free of effects. This video is a little out of date, but still does a nice job of covering trapping in a PvP situation. This video is from Skill-capped and they have many more Hunter PvP videos. Prioritize trapping healers, it annoys them and makes your job (of killing his team) easier. A focus-scattershot macro helps a lot. Grounding totem will get your trap, kill the totem if you can. Sometimes players or pets will hit the trap, meaning that your main target does not. The only cure is a bit of patience and careful trap positioning. Your spider’s web ability can stop a wrong player from accidentally or deliberately triggering the trap. As mentioned above (in the enchants section) very high level players will crush lower levels like bugs. It happened with 85s (in Cataclysm) destroying lower levels and it’s worse with the level 90 cap in Mists. Your solution is to get leveled and get to the top of the power curve ASAP, but leveling can be a bit of a drag, with thousands of quests and a few zillion mobs to kill. The cure is to snag yourself a guide that points out the most efficient path to level as quickly as possible, always showing you exactly where to go and what to do. One that’s smart enough to adjust if you grab a few leveling in PvP or the dungeons, that can adjust whether you’re brand new or decked head to toe in heirlooms, and that doesn’t care which level you are when you start the guide. What’s even nicer is if the guide will zap all of your obsolete quests (that you’re too high level to get much value from.) Zygor’s fit’s the bill perfectly and will get you to the level cap faster than anything else out there. Grab your copy here. If you like this page how about recommending it to your friends with the bar, below, or the widget to the right? Yeah, that’d be a good idea. 🙂 Working on others right now and I’m a bit slow, but I’ll put this one near the top of the queue. edit: By the way, if you ever have specific ideas, let me know. Such as you want to see this or how to do that.